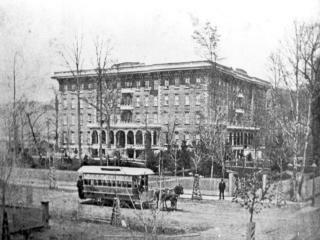 Between the years of 1864 and 1865, Peter Herdic commissioned architect Eber Culver to build the four story Park Home, then known as the Herdic House Hotel, to be a first class hotel to serve the travelers of the Pennsylvania Railroad who were passing through the city of Williamsport. The lavish structure stood on five acres of land with flower gardens, a fountain, gas fixtures, its own telegraph office, and in the front,a deer park that never contained less than 3 or 4 deer. The structure itself was a square brick building with outside dimensions of 156 feet each way and the entrance was reached by an open arch. The inside of the building was made of durable white pine while the lobby and halls were lined with marble tile from the Mosquito Valley and the rooms were sumptuously furnished with accommodations for 700 guests. As originally laid out, the hotel had two large dining rooms on the west side separated by a partition that could be partially removed. The kitchen was on the railroad side of the building, and in the basement was a restaurant chiefly patronized by passengers on trains that stopped at the station. It is said that, in his contract with the railroads, Herdic had arranged that there would be no other main station in Williamsport, and the trains arriving near mealtime would stop twenty minutes for meals.When trains stopped at the Herdic Hotel Station, the first noise heard by the passengers was the loud beating of a large gong and a fog horn voice announcing that meals were ready for serving at the hotel dining room. Not long after the hotel was built, it became quite a summer resort, and large numbers of people came from Philadelphia, Washington, New York, and Baltimore to spend all or part of the summer in the spacious buildings and grounds. The rates were moderate, the highest not exceeding $3 per day. Herdic had also built a gas manufacturing plant across the street to light the hotel and other buildings in the city. Everything had been tested and it was expected that the hotel would be in a blaze of glory from the gas lights. During the day of the opening night, the gas plant took fire and burned to the ground. Herdic had his entire staff scurrying around town buying oil lamps and candles to make the hotel light up as planned. The extravagant hotel cost Herdic $225,000 - a ton of money at the time - but unfortunately in 1878 Herdic went bankrupt and the hotel was auctioned off for a mere $1,200. The Herdic House Hotel became known as the Park Hotel in 1908 and closed its doors as a hotel for good in 1939. Also in 1939, the structure was remodeled and all the furnishings were sold. As a result of a devastating fire sometime in the late 1930's, the top two floors had to be removed, but it was said that during the removal of the two floors of the structure in 1940, the beams, 2X4's, and girders were apparently as sound as the day they were put in. It was also in 1940 that the Park Hotel became the Park Home, a retirement home for elderly women and it remained a retirement home until 1997 and has remained vacant since.